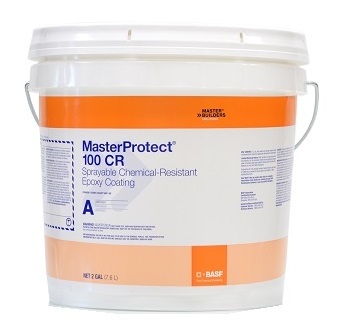 PRODUCT: MasterProtect 100CR (formerly Sewer Guard HBS 100) Epoxy Coating, 4-gallon 2-part Kit (part A + Part B, 2G each). 100% solids, spray grade high-build chemical-resistant epoxy coating. Price/Kit. For 2 kits or more it can be shipped factory-direct. MasterProtect 100CR (Sewer Guard HBS 100) is used to provide resistance to hydrogen sulfide attack in the water and sewage – treatment industries. Sewer Guard® HBS 100 Epoxy Liner eliminates the need for prefabricated or cast-in-place manhole liners.